Yeast Rad18p functions with Rad5p in error-free post-replicative DNA repair. 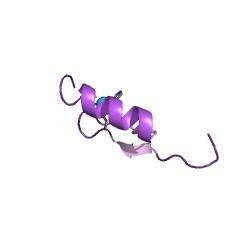 This zinc finger is likely to bind nucleic-acids. 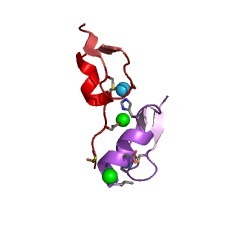 This entry represents a zinc finger motif found in proteins such as RAD18. The domain is a potential zinc finger for nucleic acid binding and a putative nucleotide binding sequence [(PUBMED:2970061)]. Human RAD18 accumulates very rapidly and remains for a long period of time at sites of different types of DNA damage, and is required of DNA. RAD18 appears to respond to DNA damage in two distinct ways: replication-dependent and replication-independent. The RAD18-type zinc finger located in the middle of RAD18 is responsible for the replication-independent accumulation of RAD18 following DNA damage, while a second zinc finger, SAP-type, is responsible for replication-dependent accumulation [(PUBMED:16980296)]. There are 2366 ZnF_Rad18 domains in 1659 proteins in SMART's nrdb database. Taxonomic distribution of proteins containing ZnF_Rad18 domain. This tree includes only several representative species. The complete taxonomic breakdown of all proteins with ZnF_Rad18 domain is also avaliable. Click on the protein counts, or double click on taxonomic names to display all proteins containing ZnF_Rad18 domain in the selected taxonomic class. van der Laan R et al. Characterization of mRAD18Sc, a mouse homolog of the yeast postreplication repair gene RAD18. The RAD18 gene of the yeast Saccharomyces cerevisiae encodes a protein with ssDNA binding activity that interacts with the ubiquitin-conjugating enzyme RAD6 and plays an important role in postreplication repair. We identified and characterized the putative mouse homolog of RAD18, designated mRAD18Sc. The mRAD18Sc open reading frame encodes a 509-amino-acid polypeptide that is strongly conserved in size and sequence between yeast and mammals, with specific conservation of the RING-zinc-finger and the classic zinc-finger domain. The degree of sequence conservation between mRAD18Sc, RAD18, and homologous sequences identified in other species (NuvA from Aspergillus nidulans and Uvs-2 from Neurospora crassa) is entirely consistent with the evolutionary relationship of these organisms, strongly arguing that these genes are one another's homologs. Consistent with the presence of a nuclear translocation signal in the amino acid sequence, we observed the nuclear localization of GFP-tagged mRAD18Sc after stable transfection to HeLa cells. mRNA expression of mRAD18Sc in the mouse was observed in thymus, spleen, brain, and ovary, but was most pronounced in testis, with the highest level of expression in pachytene-stage primary spermatocytes, suggesting that mRAD18Sc plays a role in meiosis of spermatogenesis. Finally, we mapped the mRAD18Sc gene on mouse chromosome 6F. The Saccharomyces cerevisiae RAD18 gene encodes a protein that contains potential zinc finger domains for nucleic acid binding and a putative nucleotide binding sequence. The RAD18 gene of Saccharomyces cerevisiae is required for postreplication repair of UV damaged DNA. We have isolated the RAD18 gene, determined its nucleotide sequence and examined if deletion mutations of this gene show different or more pronounced phenotypic effects than the previously described point mutations. The RAD18 gene open reading frame encodes a protein of 487 amino acids, with a calculated molecular weight of 55,512. 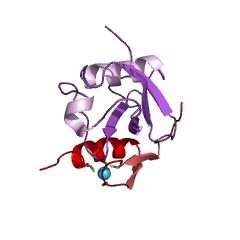 The RAD18 protein contains three potential zinc finger domains for nucleic acid binding, and a putative nucleotide binding sequence that is present in many proteins that bind and hydrolyze ATP. 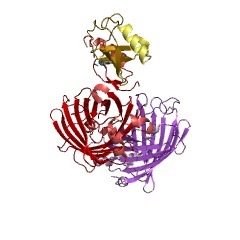 The DNA binding and nucleotide binding activities could enable the RAD18 protein to bind damaged sites in the template DNA with high affinity. Alternatively, or in addition, RAD18 protein may be a transcriptional regulator. The rad18 deletion mutation resembles the previously described point mutations in its effects on viability, DNA repair, UV mutagenesis, and sporulation.